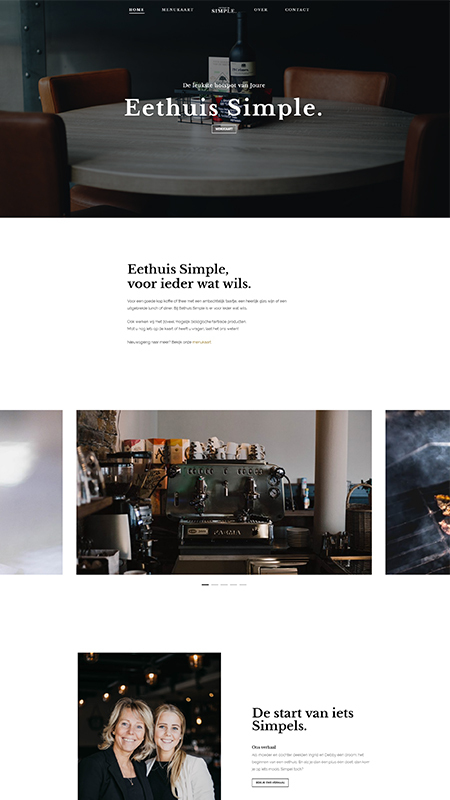 Eethuis Simple – Visual / UI & UX Design. Eethuis Simple is a hotspot based in Joure serving some of the greatest food and drinks you’ll be able to find in the northern parts of the Netherlands. A place focused on giving their customers the best experience possible when visiting the beautiful town. During the project I worked on the Visual / UI design aspect of the website as well as making it as user-friendly for the customers as possible. Visual / UI & UX Design, creating the corporate identity. Achieving an aesthetically pleasing website which at the same time is user-friendly and works flawlessly on desktop, mobile and tablet. As the company did not have any prior corporate identity we were also tasked with finding which colours, typography and imagery matched well with the overall aesthetic of the restaurant. Eethuis Simple, based in Joure, Friesland. No clutter, clean and user-friendly. What even is a desktop? Desktop, mobile, tablet, you decide. Top-notch photography, thanks to Lisa van Eijl photography. Everything else, you can find on Dribbble, Instagram or LinkedIn.